The medallion snaps on easily to the dog’s collar so there is no mess and no stress! It is available in 3 different weight sizes. The medallion contains a powerful synergized pyrethroid - zetacypermethrin - that kills adult fleas and ticks at maximum efficacy. The second ingredient, Piperonyl Butoxide, is a mixedfunction oxidase inhibitor which ensures the maximum effectiveness of Spectra Shield against ticks during all stages of their blood-feeding life cycle. While this highly effective combination protects pets, it exhibits very low toxicity to animals and humans. Spectra Shield™ - Sustained Release Delivery System: Continuously releases very small amounts of active ingredients, Consistently replenishes the actives to the dog’s skin and hair coat, and Avoids heavy concentrations and variations of active ingredients. Quick and Easy, snap on motion. 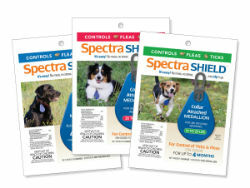 Flea & tick protection for 4 months at a great value. Convenient alternative to monthly treatments. No more hassle remembering to apply every month. Can be worn during swimming or bathing. No activation needed... Just clip’n go! Options: 14 to 29 lbs. 30 to 55 lbs. Over 56 lbs. Step One. Open clasp and slide around the “D” ring on dog’s collar. Step Two. Close clasp halves and press together until it clicks into place. Step Three. When properly closed, both halves will line up evenly. The medallion must swing freely from the “D-ring” on the dog’s collar. To open the closed clasp, pull the 2 sections away from each other at the top of the oval to release them and open clasp.